Sometimes, your finger can get so swollen that you will not be able to remove the ring out of it. If this kind of accident happens to you, make sure to remove the ring as soon as possible in order to reinstate a normal blood flow to the affected finger. There are some other factors that can cause a swollen finger, such as eating certain substances like sodium. If that is the case, your fingers will become so swollen to the point that no ring could be removed. Most of the people would rather try any means to remove the ring then to have the ring cut off. 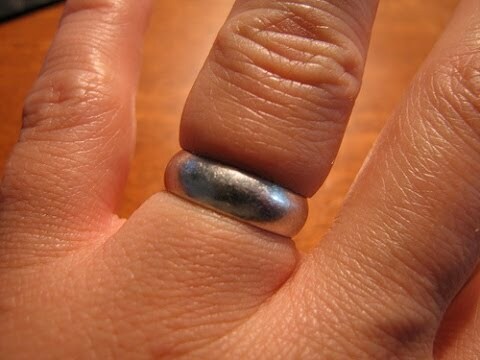 In one of the links spraying the affected finger with Windex will loosen the ring enough to remove a stuck ring. Another method called the undertaker ring method requires using an elastic oxygen mask strap. The method calls for wrapping the affected finger tightly with the elastic strap, then threading it underneath the stuck ring and being able to remove the ring that way. Neither of these methods should be attempted if there is an injury on the finger, or if the patient cannot handle the pressure of the wrapping up of the finger. If neither of these methods work, as a last resort, you might have to have the ring cut off in a hospital, or sterile medical setting.